Herald A. Demaree, Jr., 91, passed peacefully on April 1, 2017 at Riverwalk Village in Noblesville, Indiana. He was a patriot, a wildlife specialist, an historian and a father, brother and grandfather. The son of Lola Doris (Clore) and Herald A. Demaree, Sr., the longtime Atlanta resident was born Jan. 29, 1926 in Franklin, Indiana, where he helped his family farm, learned to be an outdoorsman and worked in the town grocery. He explored the woods, becoming an expert tracker and survivalist. He took every math and science class offered at Franklin High School. His childhood experiences would serve him well during his time in the US Army from 1944-1946, serving in combat as company First Scout for Co. B, 7th Infantry Regiment, 3rd Infantry Division from February thru April 1945 in France and Germany. He fought in the battles of Colmar, the Siegfried Line, Rhine crossing, and Nuremberg, and was wounded by enemy artillery fire at Metiegen, Germany. He earned the Purple Heart and Bronze Star. A fellow Company B soldier present at a unit reunion once commented to his family that they never lost a soldier to ambush or unexpected combat when Herald was scout. His experiences during WWII were included as a chapter in the book "The Outdoor Kids," compiled by Robert S. Appel from writings submitted by the men of Company B. 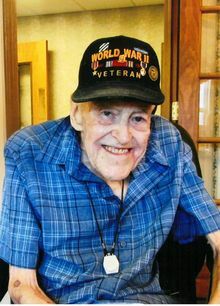 Friends and family will forever remember him proudly wearing his WWII Veteran cap wherever life took him. He and his wife, returned to Indiana to farm and raise a son, Jason Kirk. Here, he began a 35 year long career with the Indiana Department of Natural Resources, as a wildlife research biologist. He became well-known for his work in the field of tick-borne diseases. Herald's interest in genealogy and history prompted him to give 25 years of dedicated service to the Hamilton County Cemetery Commission, where he was president through 2016. He held lifetime memberships in the Society of the 3rd Infantry Division, VFW, American Legion, the Blatchley Nature Club, the National Audubon Society, and the Hamilton and Johnson County historical societies. A sister, Eleanor (Demaree) Arnold, preceded him in death. In addition to his son, he is survived by a brother, Kenneth (Barbara) Demaree, Franklin; two grandchildren Rachel (Flip) Collins, Washington, DC, and Jason Christopher, Westfield; a daughter-in-law, Rosalyn, Atlanta; and seven nieces and nephews. A graveside service with military rites will be held Saturday, April 29, 2017 at 2:00pm at the Arcadia Cemetery. Memorials may be given to Cicero Veterans Memorial Fund through Hartley Funeral Homes, Cicero, Indiana, which is handling arrangements. Add Photos, Videos, Music that tell the story of Herald's life.